We beg for a reprieve from this waking life—from the alarm clocks that operate as instruments of torture (one morning it occurs to us that we could muffle the sounds of our ringtones with a mallet, but we decide against it, because our phones are our appendages and there are e-mails that require our immediate, 6:52 a.m. responses); the motley lot who test our sanity during an Odyssean commute that convinces us that purgatory is indeed real (and not of Dante’s mythic and poetic invention); the coworkers who are predators posing as house pets; the calls and meetings and crises (which are never really catastrophes, although we sometimes enjoy our own telenovelas) we navigate on tightrope; the bills that pile up and make us wonder why we even went to graduate school at all—we pray that today won’t be the day when we realize that this is our life. We crawl out of bed, commute, eat at our desks, spend twelve hours in front of a computer, race to the gym, have the obligatory drink with friends in which we play therapist or life coach, inchworm to bed (if we’re lucky), and wake to do it all over again. Some of us can’t remember the last time we saw our children in daylight during the week. For most of us, this is our life. Yet, at night, in the dark, or during the day, as we browse the Web, we create our own worlds and we settle into them as if it were a house, and we shudder in the reverie. Last year, I built a second life for myself, because I couldn’t endure the unremarkable one I was living. I had existed only in the space between my office and an airplane, and I knew that I was missing my loved ones’ minor moments and major achievements. I knew that my cat was inching her way to the grave with her matted fur and quaking, frail body. I knew that I was tired and prone to snapping at people for no apparent reason. I knew that I was a pale version of the woman I used to be, one who published literary magazines, wrote books, traveled, loved, and lived. I became a connoisseur of online food delivery, a practitioner of abject denial, because hadn’t I worked hard for this great paycheck and heartbreaking misery? I remember noticing Kinfolk in my favorite bookstore, and was immediately drawn to the cover that featured a woman’s face obscured by a cast-iron skillet and the paper stock that smelled faintly of old books. The white space mesmerized me. I subscribed, and when it arrived, paged through each issue obsessively, and as I’d done previously with stylized editorials in fashion magazines, I fell in love with a life without messy kitchens or endless e-mails; without interminable phone conversations with clients during which I’d convince them that everything in the world is our agency’s fault, and could we discuss marketing plans for the holidays while we’ve got you on the line? I coveted this life in Technicolor, those billowing curtains, crackling fires, and hot pastry served on linen cloth. One morning in January, I sat in my mentor’s office and he asked me if I was happy. Are you happy? Because you don’t look happy. I remember my body being volcanic, and through tears I said I needed to quit. It was then that I made the very bold and brave decision to leave comfort and logic behind. When I resigned from my job in March, I went home and cried in the shower. Two weeks later, I boarded an airplane that took me to Europe, and I armed myself with a stack of Kinfolk issues, because now I had time to read the magazine. I had time! Initially, I thought the magazine was an inch above the fold with its lush photography, impeccable layouts, and care given to design and aesthetic. However, as soon as I started to read the publication, the same slew of ubiquitous bloggers I’d seen online now, appearing in the printed publication, became the equivalent of records played on repeat. Most of them, while stylish and artistic in their own right, weren’t exactly meant to be writers. The stories were uneven, the stuff of first drafts at writing workshops, and I felt as if I were paying a handsome sum of money to access pretty photos and, more unsettling, to escape, albeit briefly, to a very privileged and unrealistic representation of a life. That is what started to grate at me. I’m thirty-seven years old. Am I back in high school, donning acid wash while lamenting Angela Chase’s love for Jordan Catalano in My So-Called Life? Shall I check my Warby Parkers at the door? After reading this piece, I learned that Kinfolk doesn’t exercise a stringent submission policy or apply a set of standard editorial guidelines; rather, contributors are consistently hand-selected by the editors (gifted photographers, Alice Gao and Nicole Franzen, often grace the magazine’s pages) and then given complete carte blanche over the pieces that they publish — the glow of their stardom seemingly overpowered objective and skilled editorial oversight. I published an acclaimed literary magazine for six years, so I understand the importance of soliciting work from well-known artists and how it can elevate a publication and develop both an audience and provenance. However, I also understand the importance of leveling the playing field, of giving new writers a voice in a space where publishing one’s work had become an increasingly impossible proposition. As anyone who’s been involved in the publishing industry knows, when you purposely shutter the windows and close the gates, you become stale, irrelevant, one-note. As curators and editors, it’s our job to ferret out work that gives our hearts collective pause, reaffirming our belief that beauty always exists in the ordinary. As someone who knows the tireless work that goes into printing an independent publication, I didn’t give up on Kinfolk just yet. In fact, I regarded their forthcoming cookbook with interest. Here I would have access to remarkable, simple dishes under the auspices of editors who wholly appreciate presentation and design. Then I got the cookbook. Blogger buddies and escapism abound, my friends. It’s rare that a cookbook would evoke such vitriol, but after I received The Kinfolk Table: Recipes for Small Gatherings, I was livid. I realized that this wasn’t a celebration of food and gathering and the magic those two ignite, this was the sound of one hand clapping, a coffee-table book devoted to the very “cool” artists and Web celebrities from across the country. The narrative principally centers on the people, not the food, which would be fine if that were the intention. Without a clear narrative and culinary journey, we’re left to merely weave in and out of kitchens like a spool of thread, but we’re not invited to linger. Rarely do we see the fruits of the contributors’ labor and the gatherings they so fastidiously rhapsodize. The Kinfolkers drive miles for mussels and set a formidable table in their outdoor barns. Theirs is a life of a cultivated beauty that serves up the illusion of simplicity. 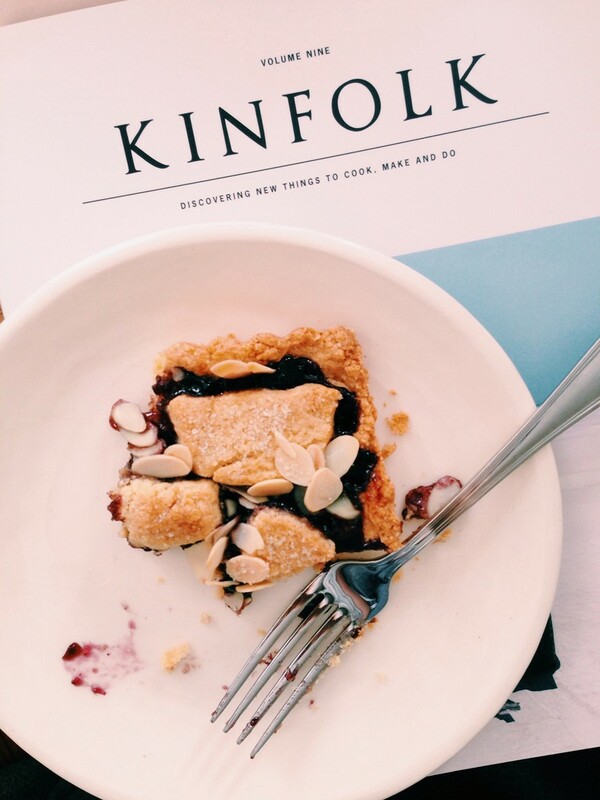 In reality, the Tao of Kinfolk is nothing more than understated affluence and luxury. Theirs are gatherings where meals are photographed with a thousand-dollar camera; where everyone has clean skin, shiny hair, and ebullient optimism; where kids play around the paddock. Theirs is a world that exists for few. There is no real visceral connection between image and type. Rather, the cookbook tells us the story of people who project the lives you wish you could live, and the recipes are merely an antecedent to that lovely fiction. More troubling was the editorial decision to segment the book by “place.” The Kinfolk Brooklyn is whitewashed and moneyed, devoid of flavor, color, or texture. Where is the Russian food? Where is the Caribbean food? Dominican, Italian, Polish, etc.? Having grown up in a borough so rich in gastronomic culture, I remember those diverse meals when you talk to me about Brooklyn food. I don’t recall precious dishes made by transplants to the better known and more affluent areas of the borough (Park Slope, Williamsburg, Cobble Hill, and so on), who have a noticeably homogenous look and culinary point of view. Note to everyone, everywhere: Living a simple, mindful life needn’t be this fanciful, inaccessible, or expensive, and it doesn’t call for flatware from ABC Carpet & Home OR accoutrements from West Elm. Great gatherings require little fanfare or ornamentation, just some good food and conversation. Growing up in Brooklyn, our chicken was from the local bodega (one dollar per leg), and we drank grape juice while the Johnny pumps went on full blast into the twilight hours. We traded stories on the stoop and laughed so hard we ached. Where is that Brooklyn? Where are those stories? Where is the exuberance and childlike wonder? The laughter? So much for the Kinfolk founder’s claim that his cookbook will “peel off the fluff and commercial layers that complicate entertaining,” and if that passion can’t be seen in the pages’ austere white dining rooms, it certainly won’t be found in the book’s recipes. The cooking instructions are as carelessly delivered as those anesthetized settings are carefully crafted. Because, like those spaces, the composition of the recipes is cold, formulaic, sometimes off; it hardly connects the meal to the person to the story to the gathering that celebrates it all. What is it, then, that we’re celebrating? A life lived in organic sepia? A life lived through the lens of those who photograph it? While you could argue that, perhaps, I’m not part of Kinfolk’s target audience, I’m indeed part of the audience for homemade food that has the ability to connect loved ones. Yet, as executing a handful of dishes proves, the book has some demonstrable flaws where procedure and chemistry are concerned. Many recipes miss key steps in their methods, or offer ingredients that yield imbalanced flavors and textures. If I’m not a trained baker or a chemist and can recognize the flaws simply by reading the recipes, what of the reader who wants only to fix a good meal? 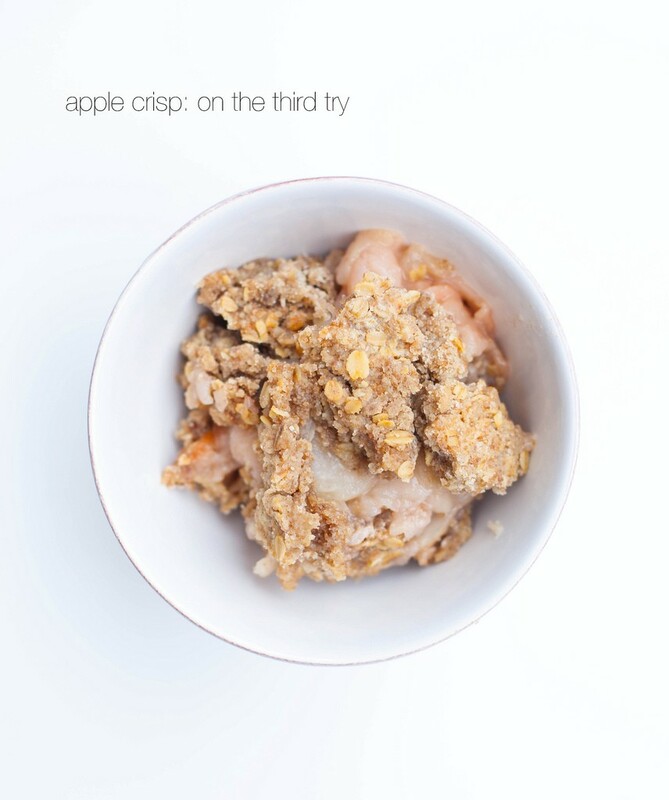 I made Sam and Ashley Owens’s Apple Crisp twice following the recipe to the letter, and both times the crisp failed. Know that I’ve been making pies, crisps, and crumbles for the better part of a decade, and the recipe is flawed from top to bottom—the technique, texture, and flavors are off. The juice of two lemons, tart apples, and a quarter cup of sugar yielded a pronounced citrus note that overpowered the apples and cinnamon. The topping was entirely too sweet, sickeningly so, relative to the amount of flour in the recipe, so, on the third go, I was forced to make significant alterations. Additionally, covering the crisp with parchment and wax, as instructed, only added to the cooking time and didn’t do anything in terms of the final product. I could have easily done without it and enjoyed a simple crisp. However, since Sam and Ashley’s crisp was tented, I had to increase the cooking time to achieve a brown crust, which inevitably yielded a center with the consistency of applesauce. Although the two can carry a tune and drape a dress—he’s a musician; she, a designer—I strongly question their culinary prowess. You can’t know how close I came to hurling this book out the window. I’d spent a pile of money on butter, flour, apples and sugar only to witness a recipe fail. It should be noted that Doug and Paige Bischoff’s Rosemary and Roasted Garlic Bread was a triumph. Roasting the garlic for an hour resulted in a sweeter, less pungent flavor that married perfectly with the fresh rosemary. 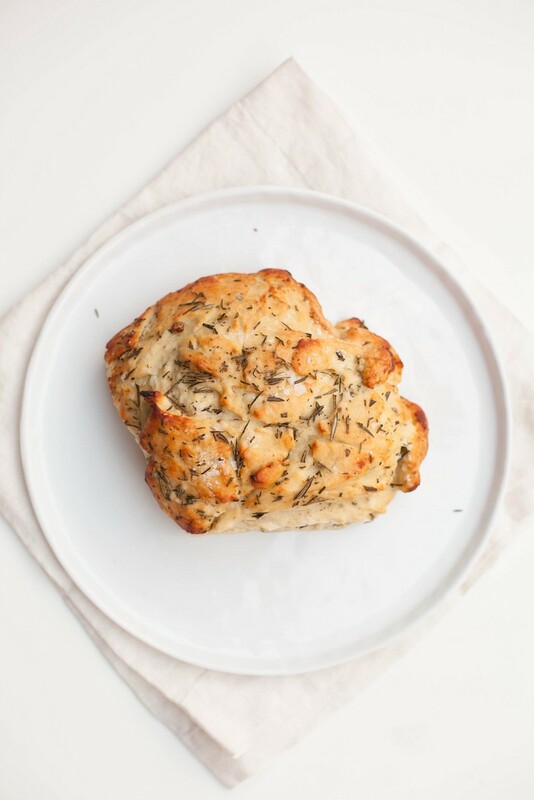 While bread making isn’t entirely difficult, it’s time-consuming, and one has to be vigilant in upholding the integrity of the method: kneading and allowing the dough to rest and rise. A few critical steps were missing from this recipe, namely, the timing of kneading by hand versus by mixer. At the onset, we’re given two sets of instructions for the initial, critical kneading—one for a machine application and the other for a by-hand approach. However, the subsequent instructions for the next two dough kneadings were vague. In theory, the directions that follow are supposed to be synched to the stand-mixer timing; in practice, that wasn’t the case—a small point, certainly, but one that can adversely affect the end product, rendering a tough, dense loaf. Luckily, I’ve screwed up so many bread loaves in the past five years that I’ve become hyperaware of the sensitivity in making bread. 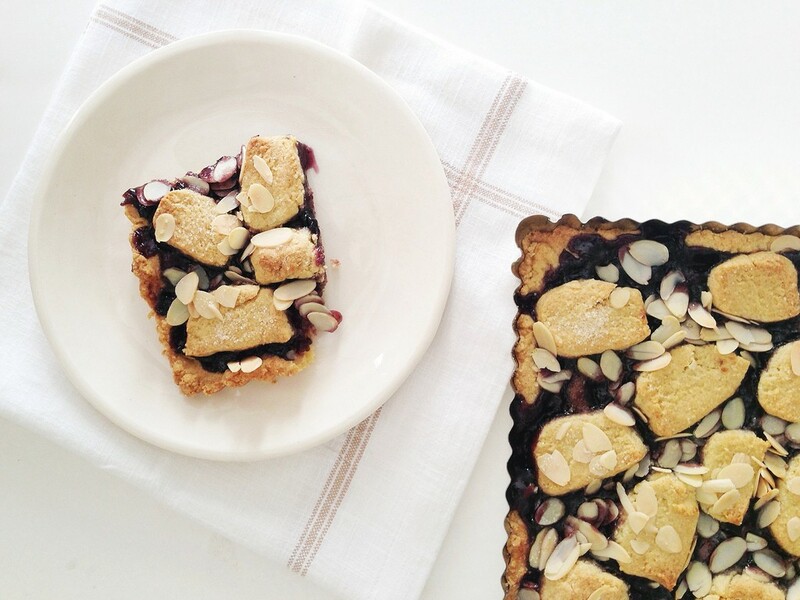 I first encountered blogger and event planner Lillie Auld’s Almond Jam Tart in Kinfolk’s autumn issue, and I was perplexed by the erroneous cup-to-grams conversion for white flour—both the overestimated amount of flour called for (in order to make this recipe sing, I eliminated a half of a cup in the final version), and the mysterious elimination of the step in the recipe in which one would incorporate the dry ingredients into the wet ingredients. Are we left to fend for ourselves and assume the obvious? And obvious to whom? (Only to those who frequently bake, OBVIOUSLY.) Or was the recipe developer asleep at the proverbial switch? My modified end result was a simple, buttery tart with a perfect crumb texture. Sara and Hugh Forte’s (of Sprouted Kitchen fame) Chocolate Chip Banana Pancakes were a standout, impeccable in terms of the juxtaposition of flavor and spice (can we talk about flax meal, vanilla, banana, and chocolate for a second? Or maybe an HOUR? ), and simple in execution. 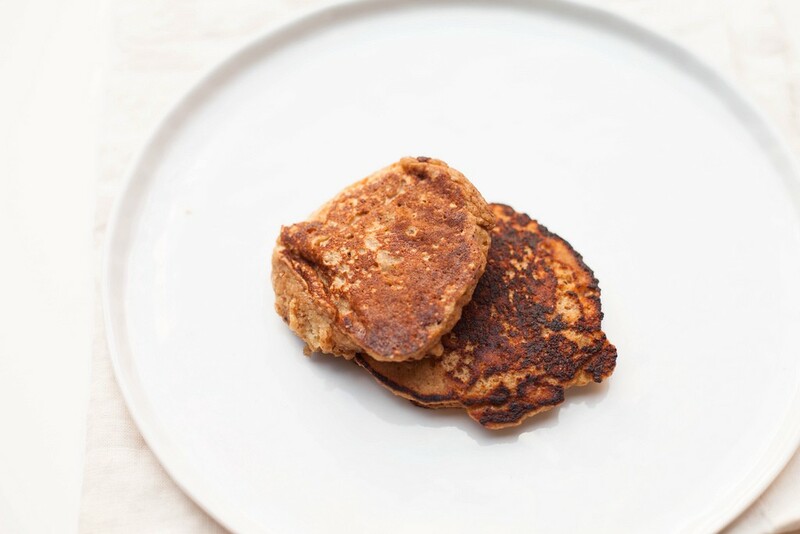 I made these semi-virtuous hotcakes this morning and they were wonderfully fragrant and a true delight. Admittedly, I felt confident in Sara’s work, as I’m a longtime reader of her lovely blog and have made many recipes from her cookbook. All of this raises a question: Were the recipes in this cookbook tested in a real kitchen so we, as consumers, may be certain the chemistry is on point? Was the cookbook proofed by professionals (of the editorial and culinary varieties)? After thumbing through three-hundred-plus pages, it occurs to me that the Kinfolk cookbook is a variation on a single theme: the creation of a life lived in an Anthropologie catalog. It’s the reason why we get lost in blogs and the lives of strangers. We want to be happy, always. We want a life free of storms and sorrow. We want our linens, and bowls, and kitchens with reclaimed wood — and in this way, Kinfolk succeeds, for its America is rarefied and specific, rife with denizens who are preened to dishabille perfection and apply pretty filters to their photos. I recall a similar charade: GOOP. While escapism looks lovely on paper, in practice it’s difficult and expensive. You don’t need a book to tell you how to gather, you don’t need a formula to cultivate simplicity. Find the people you love, a space to lay down plates, and a meal that binds the two.